The Hotel has a maximum capacity of 65 people. 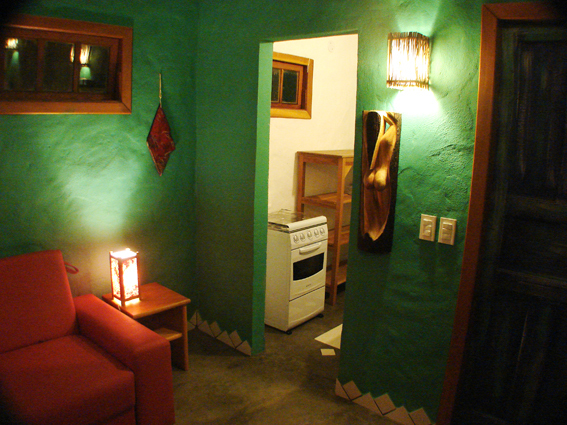 There are 2 Chalets and 10 Suites available, each one decorated in its own unique style. 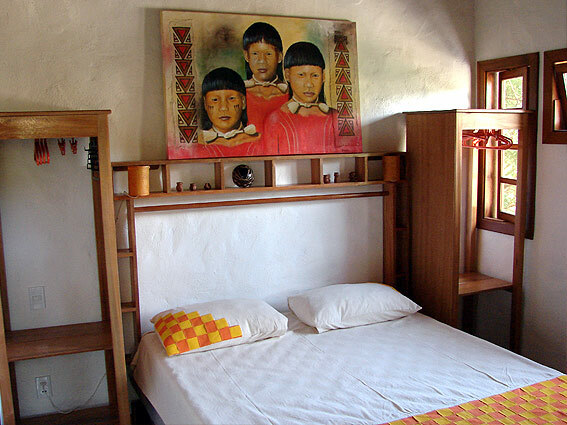 Each Chalet has two bedrooms, 2 bathrooms and a varanda You may, for a small additional fee, and depending on availability, sleep in various rooms during your stay to experience the diverse atmosphere each room has to offer. In every room you will find an attention to detail, not only in the artworks presented but also in the form of the space itself, in the choice of mosaic patterns, the positioning of crystals, shells, sculptures and furniture, all set to invoke a sense of harmony. 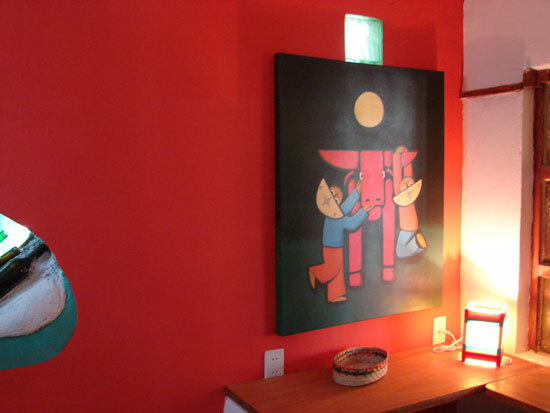 In the dining room an installation of LBC the Acquarium and others paintings of different artists. Resting upon a rock with crystal, yellow calcite and soladite sits a statue of a Siren made by the Brazilian artist Mariza Zakura. 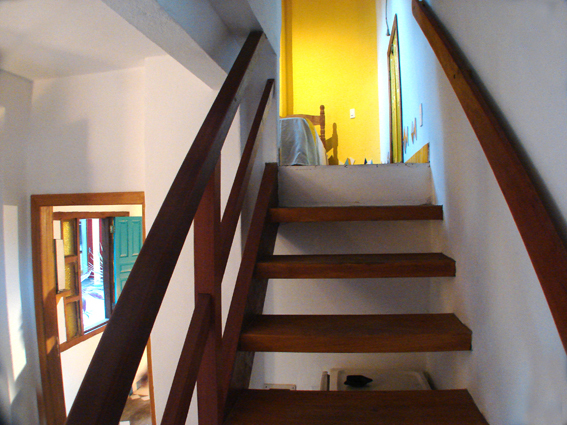 This chalet is actually two separate suites on two floors, directly in front of the swimming pool. 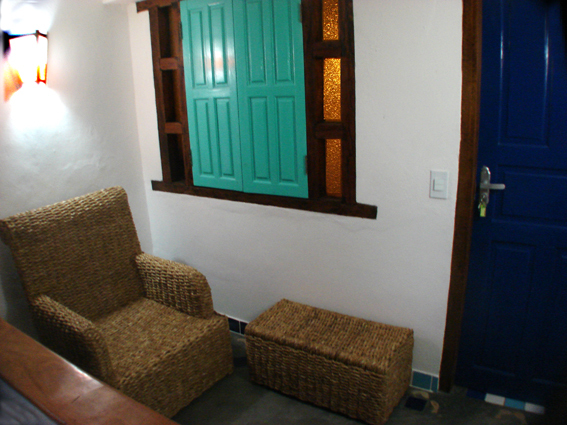 The first is nearly an alcove with a blue ceiling. 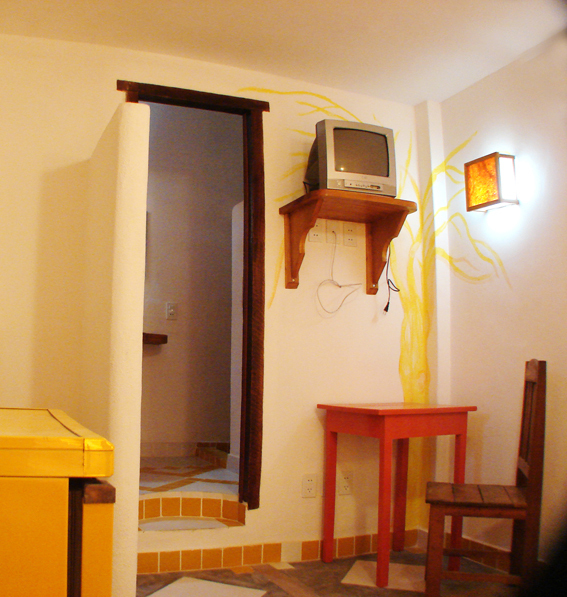 It is furnished with a closet, a television and all the necessities. 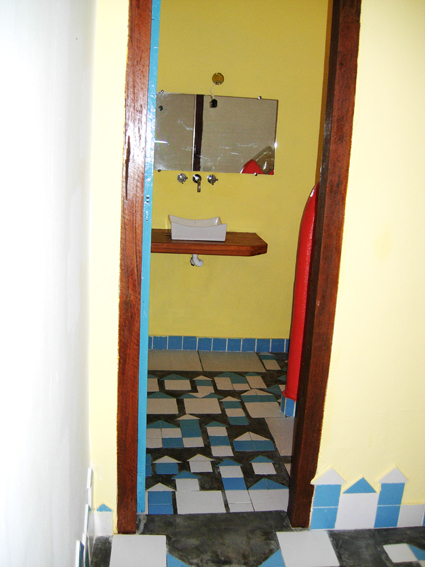 The bathroom is found at the foot of the stairs. The other suite is on the floor above boasting high ceilings, a hardwood floor and a large and luminous closed in en-suite. 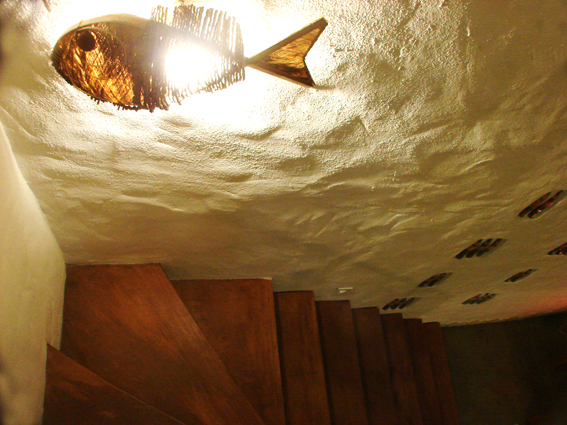 The decoration of the colourful fish was made from fragments of bricks. Red, Green, Orange and Yellow. 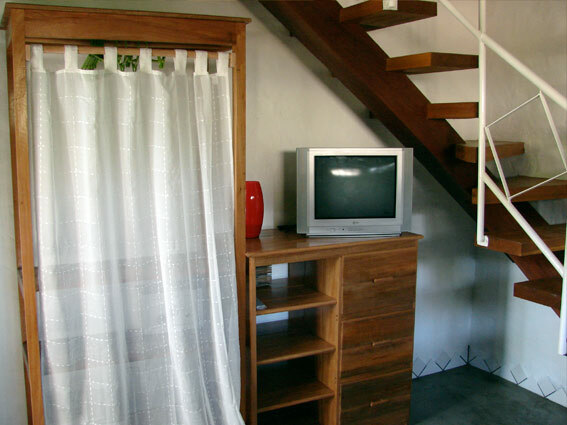 This two floor Chalet is found in front of the swimming pool and one of the gardens. 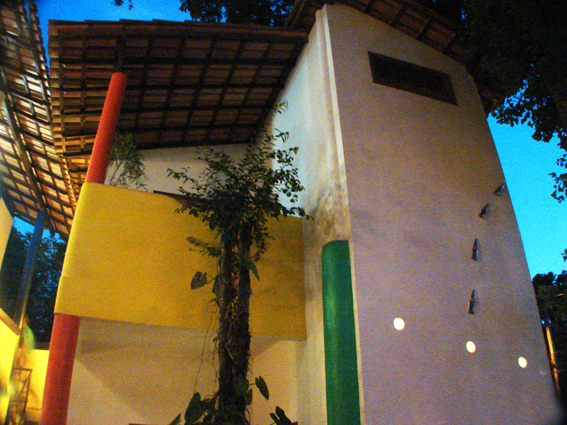 Its colour scheme is adapted from nature. 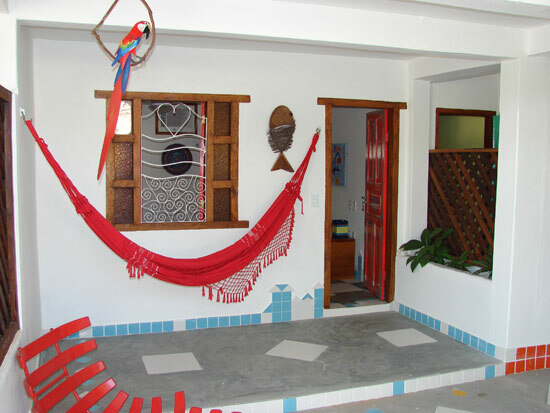 On the main floor there is a veranda, a kitchen and a small living room with a television and a pull out bed that would comfortably suite two people. 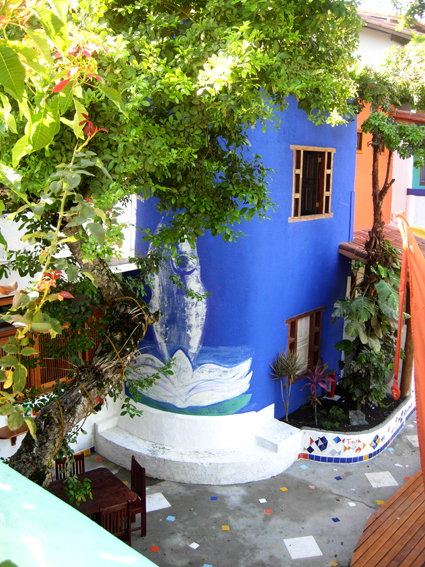 On the second floor there is a balcony. 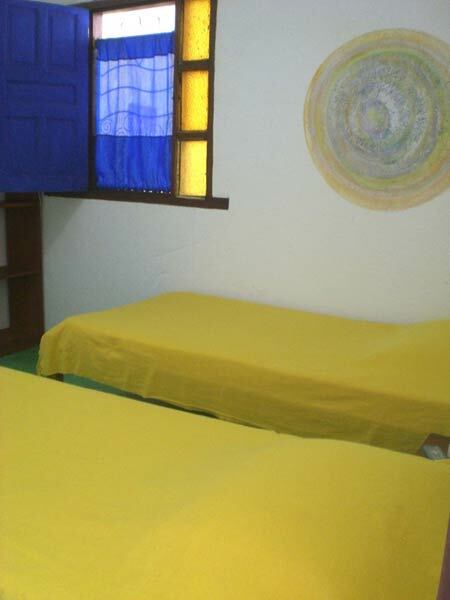 The room is decorated in earth colours and in yellow. 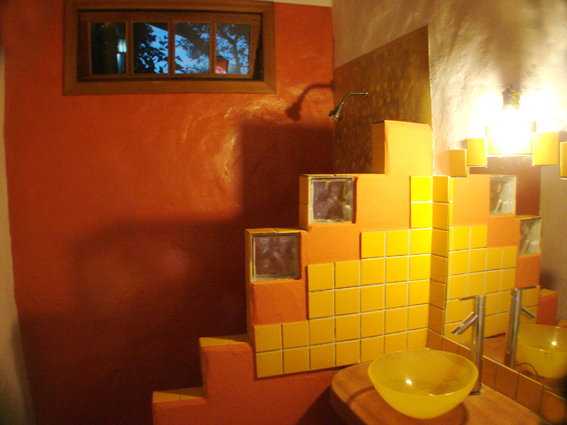 The bathroom is quite welcoming, decorated with terra cotta with yellow and orange tiles. 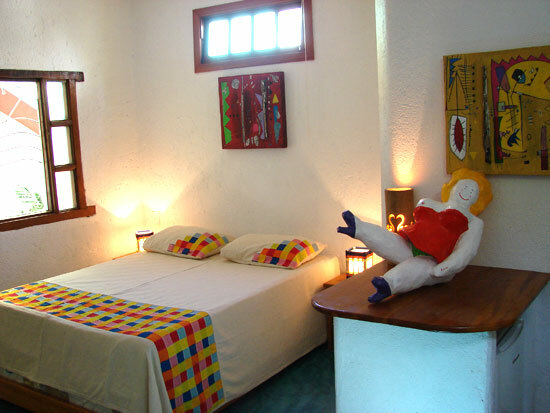 The mosaics are also found in the bedroom which is quite spacious and is dominated by a large comfortable bed. 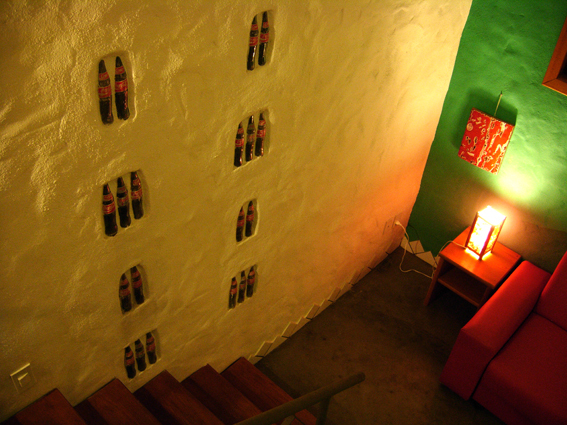 There is a fresco decorating one wall which has a bottle of Coca Cola incorporated. 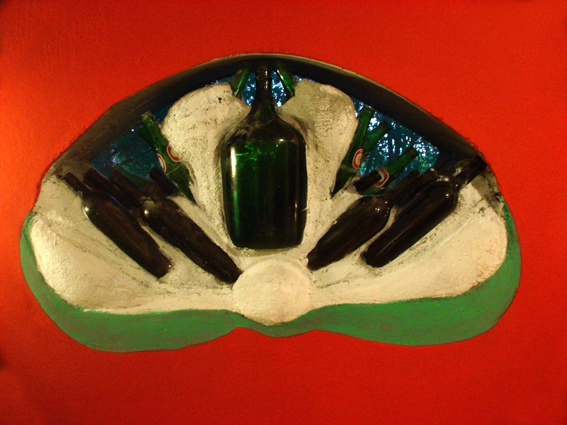 This piece of artwork is an homage to the South African Jamie Uys, the director of “The Gods Must be Crazy.” The story is that of a particular bottle of Coca Cola which is thrown from an airplane and is found by a bushman. This bottle disturbs the serenity and equilibrium of the tribe to the extent that it is condemned to be cast away at the edge of the world. White, Yellow with highlights of Orange and Turquoise. 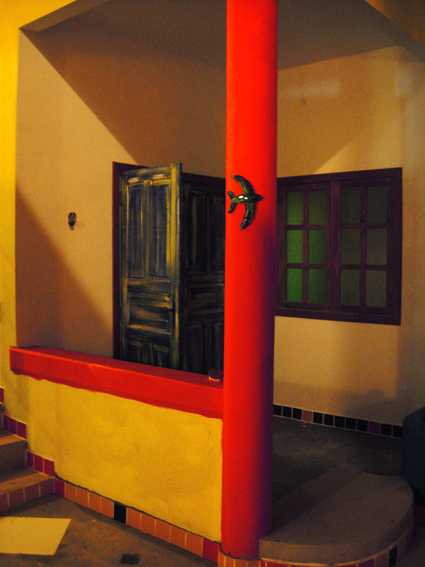 It is the first suite you pass along the walkway. 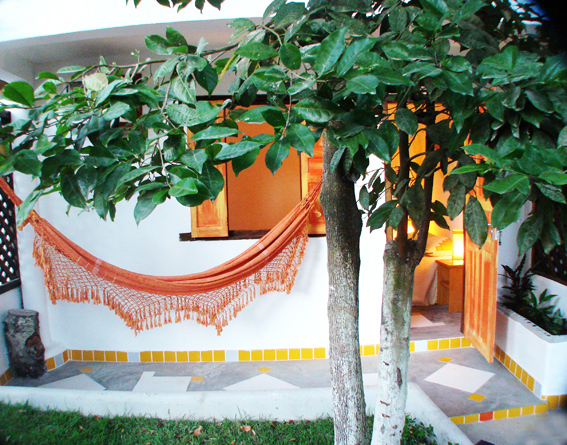 It has a large veranda, filled with flowerbeds and is located within the garden, close to the pool. 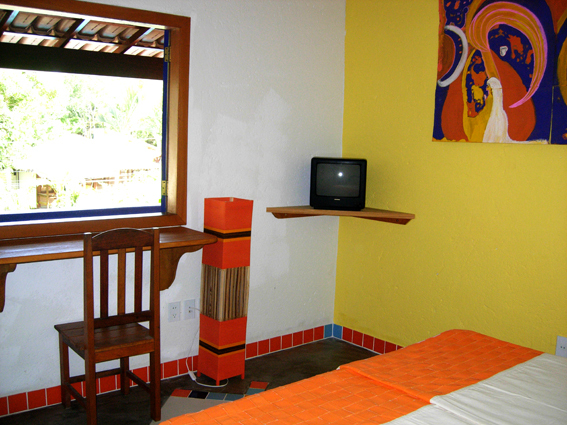 It is furnished with a closet, T.V., a desk and queen sized bed. 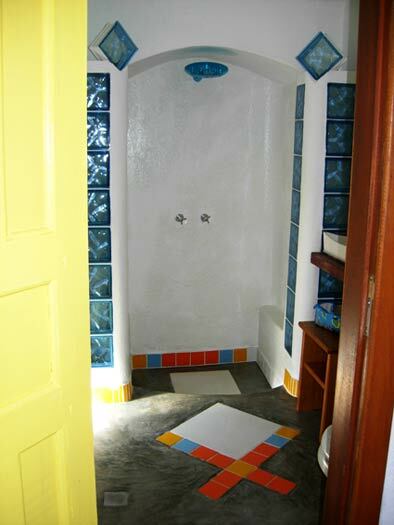 The bathroom is quaint and spacious. 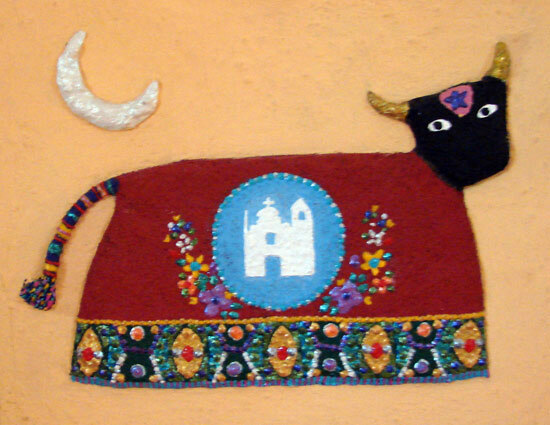 A fresco by Lorenza Bucci Casari adorns the walls. 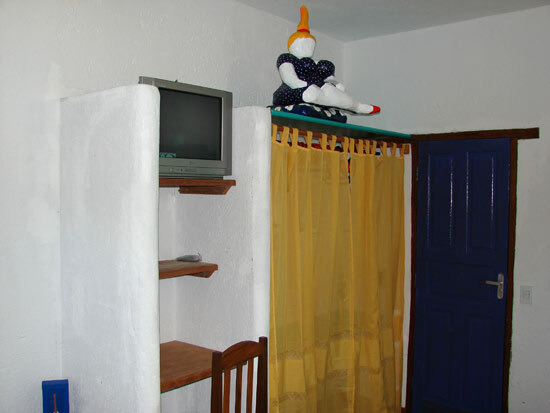 This is the smallest and most welcoming of our suites. There is a sense of ultimate privacy with this suite, being located at the end of the walkway and having quite a large veranda tucked away. 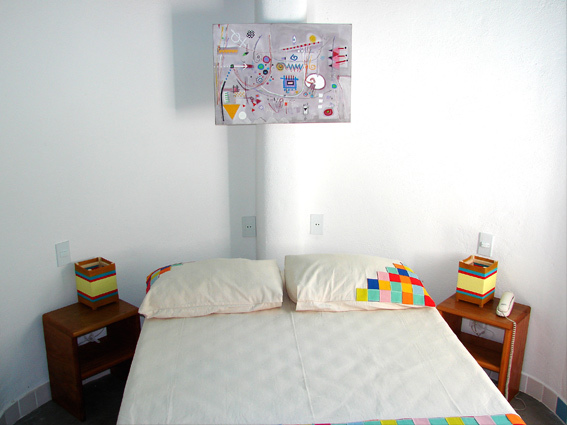 There is a queen sized bed and the room pervades a sense of intimacy. 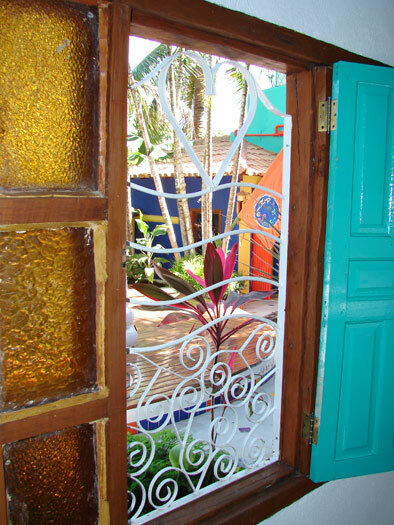 All the decorative details in the suite and in the bathroom are made of glass. 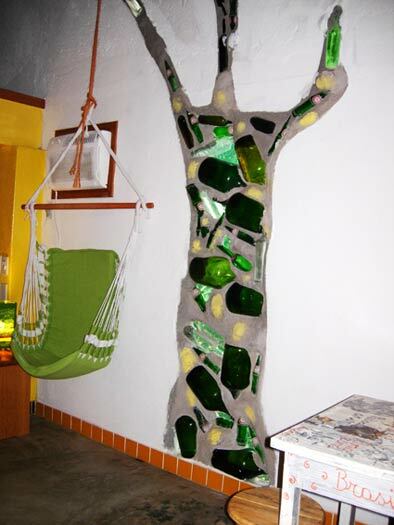 The piece of artwork is a Lotus Flower made from glass and cement. 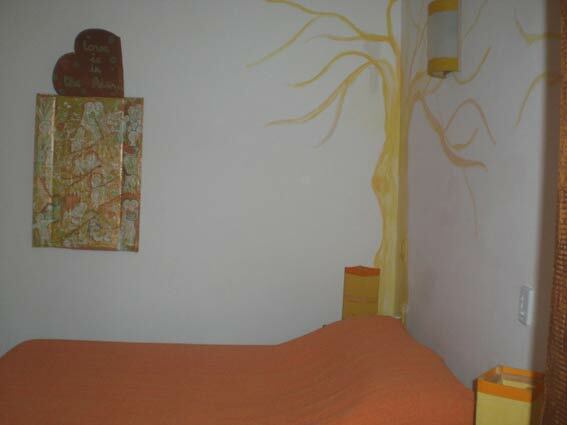 One of the walls is painted in an orange coral which warms up this room. 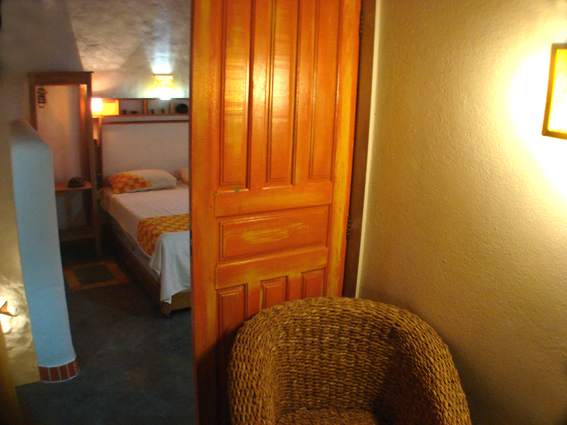 The suite is also perfect for singular occupancy for someone wanting a little peace. Red, White and Yellow . 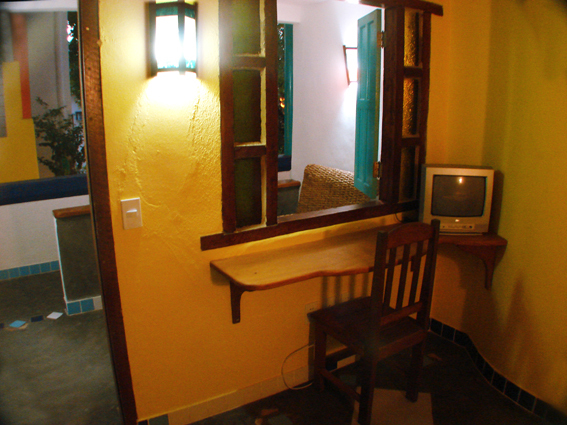 This suite is also found along the walkway and has a veranda facing the garden. The pervading mood is one of relaxation. 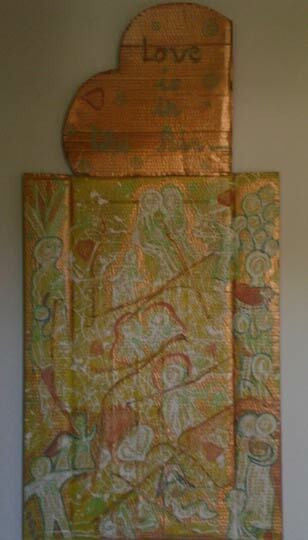 Two walls are coloured in a coral pink to accentuate this feeling. There is a queen sized bed, T.V. and desk. 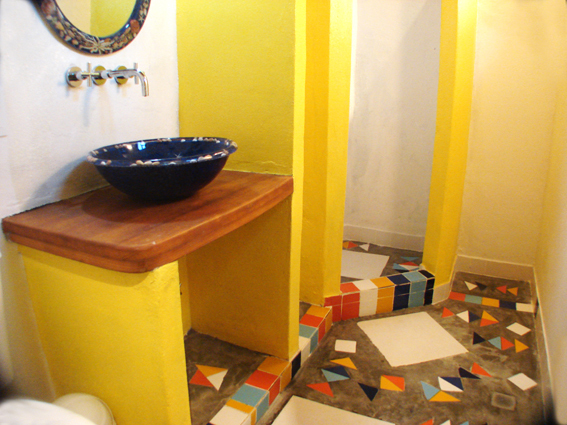 The mosaic pattern found along the walls appear to be little houses which converge and become a village on the floor of the bathroom. 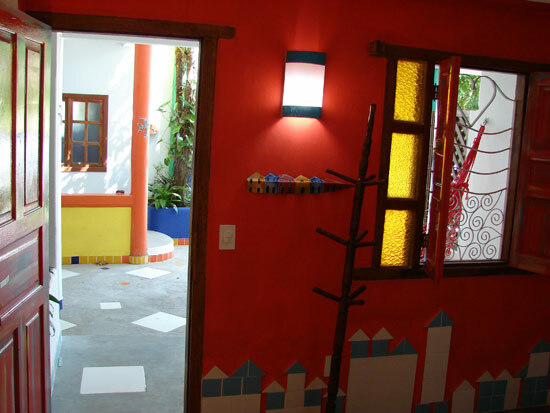 Its decoration is particularly interesting and inventive for its choice of colour scheme and the materials used. 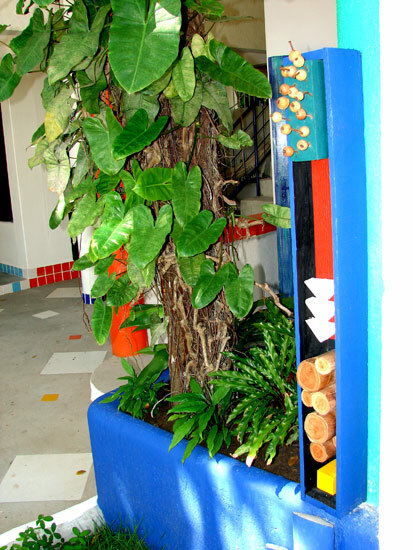 The forces of Nature shine forth through the colours and decorative elements. 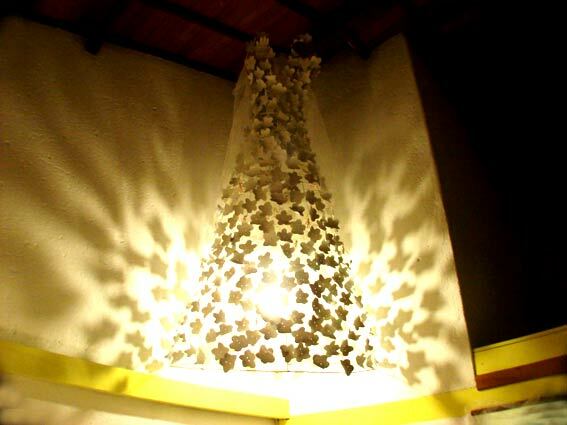 The tree is a luminous sculpture who’s light give the room a particular atmosphere. 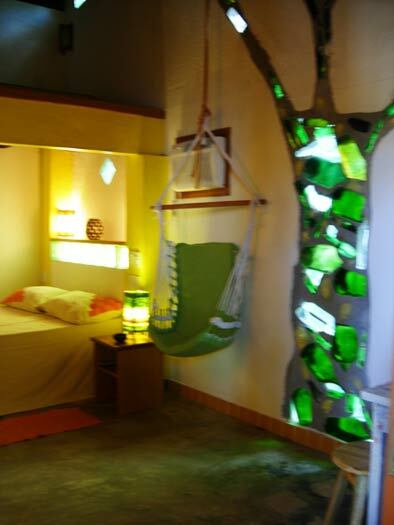 The green tones pervade emanating its beneficent vibrations and animating the room like the Amazon jungle. 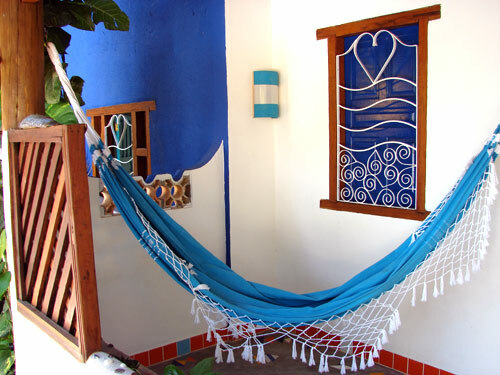 Above the queen sized bed there is a loft space where another two people may sleep, and beside it hangs a hammock chair. 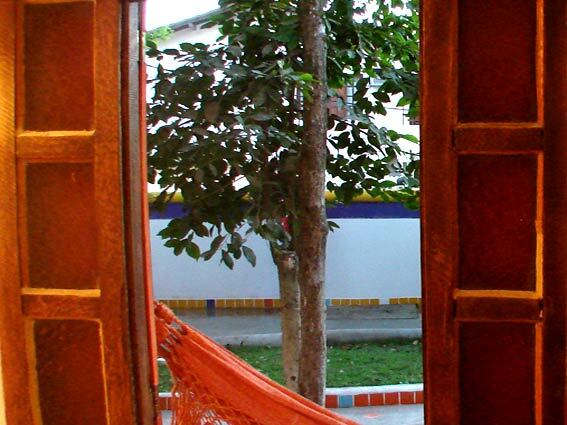 This living room can double as a veranda with the door opened. 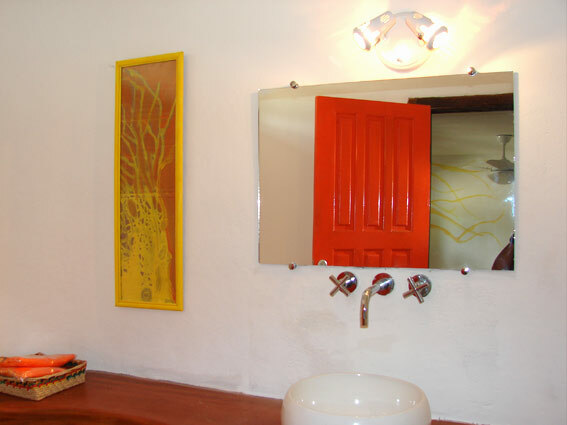 The bathroom fixtures are made with a type of resin, also green with bright yellow walls to compliment them. 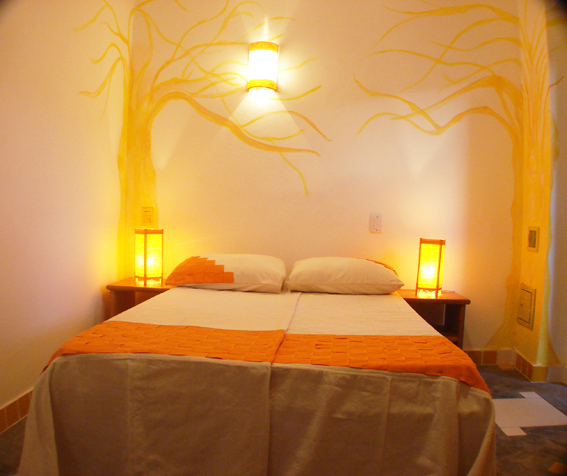 Touches of orange in the decorative pieces give this suite the warmth of the earth. 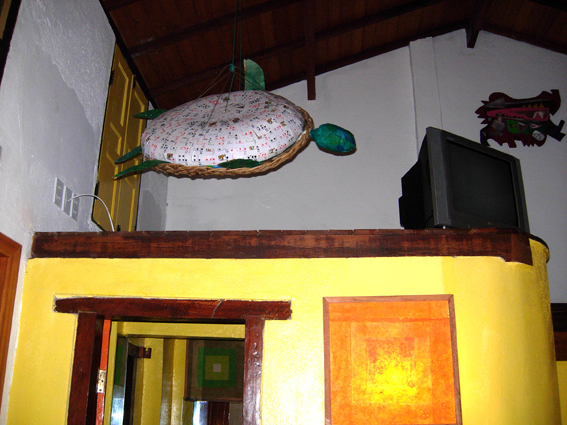 There is an iguana in the bathroom, a turtle suspended in the air and a monkey hanging from a column. 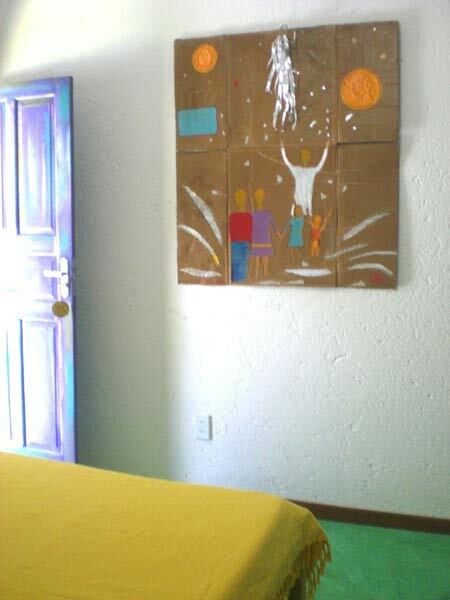 For its large size this suite is ideal for a couple with teenaged children, for four friends or for a couple that likes the grandiose things in life. 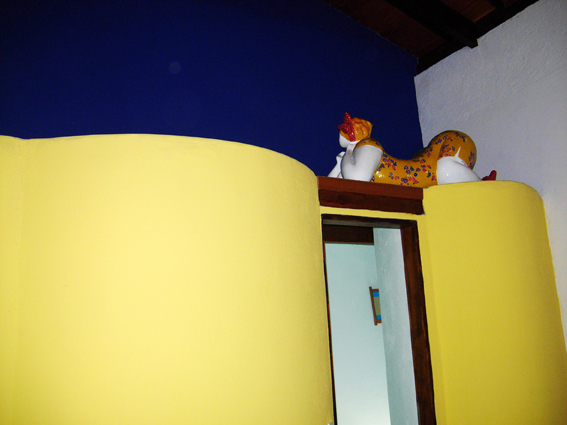 Light and Dark Blue with Yellow. 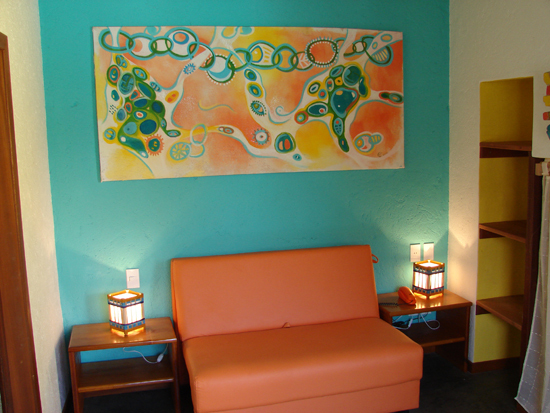 This is one of our most artistic suites. It has a private veranda. 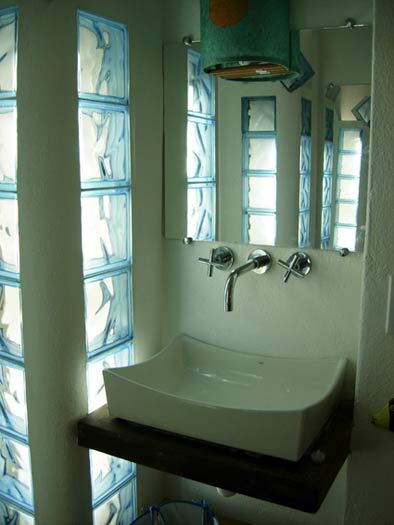 The bathroom is in the form of a number 8. 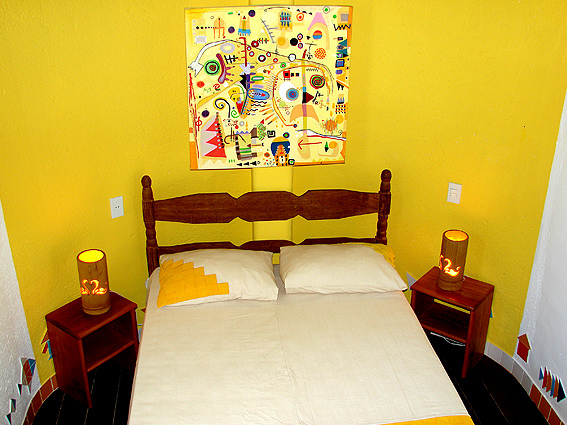 It has two rounded walls painted yellow which also form a loft where various pieces of art will be show cased. 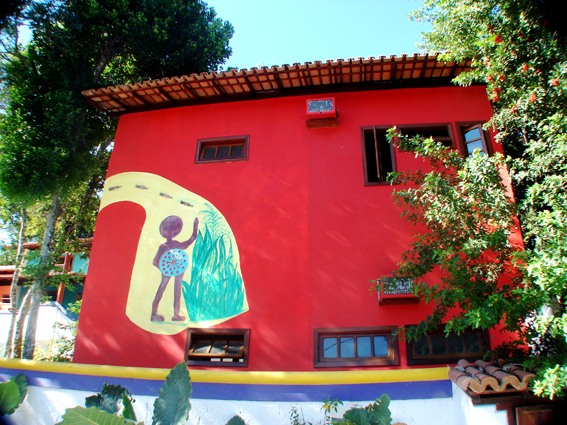 Presently you will find a sculpture “A Menina Vaidosa” (The Vain Little Girl) by the artist Mariza Zakura. 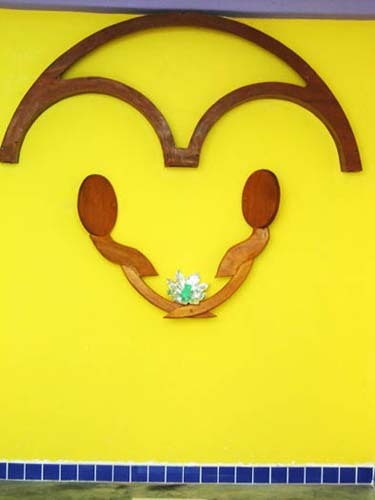 It is a sculpture of a girl looking into a mirror with a cat by her side. 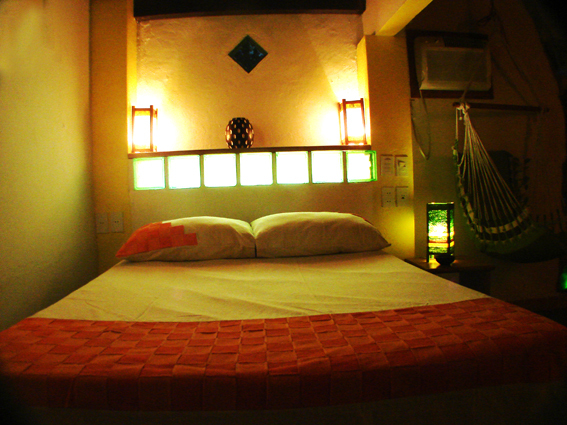 Another loft which is divided from the rest of the suite by a wave shaped wall can sleep another two people comfortably. 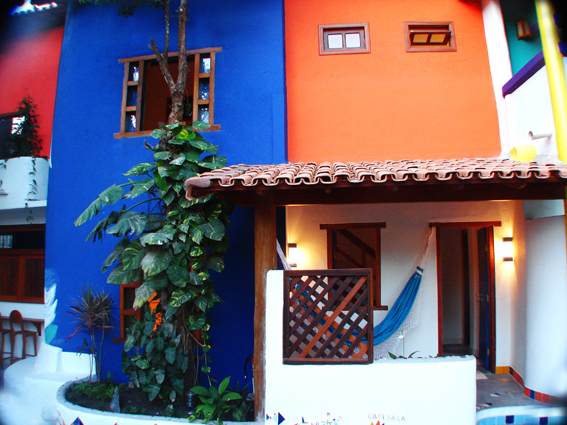 Orange, Indigo, White and Yellow. 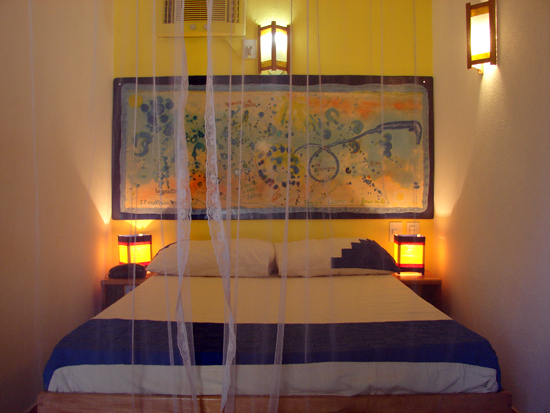 This is a very special suite, made for those who want a romantic and joyful atmosphere, such as newly weds. 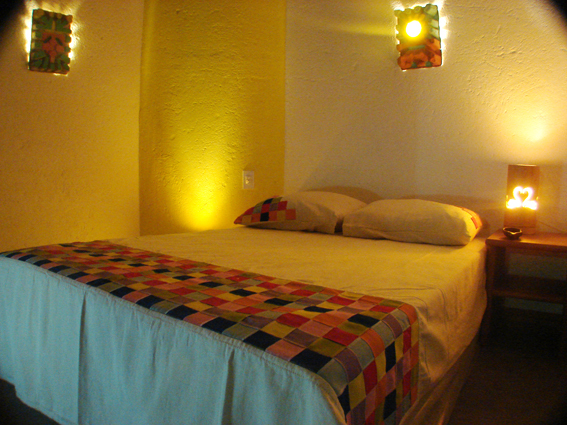 Under the loft the queen sized bed can be closed off from the rest of the room with a white curtain, which gives a sense of intimacy at the same time as protecting you from the mosquitoes. 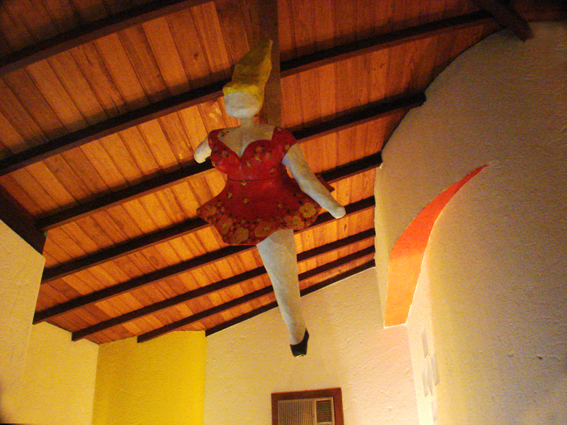 The ceiling is quite high which gives rise to a luminescent sculpture by Mariza Zakura, suspended in the living room area. The subtle play of light and shadow gently illuminates the night. 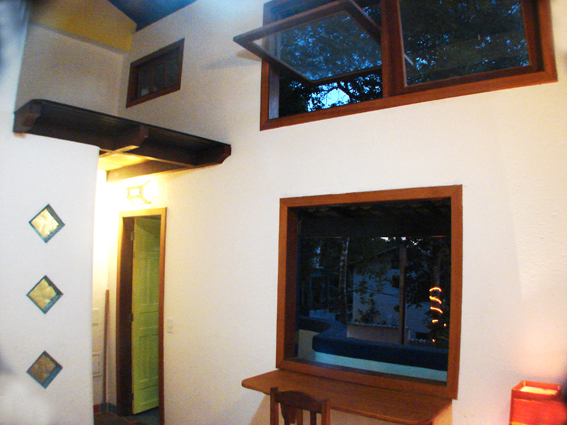 The living room area doubles as a veranda if you open the doors. 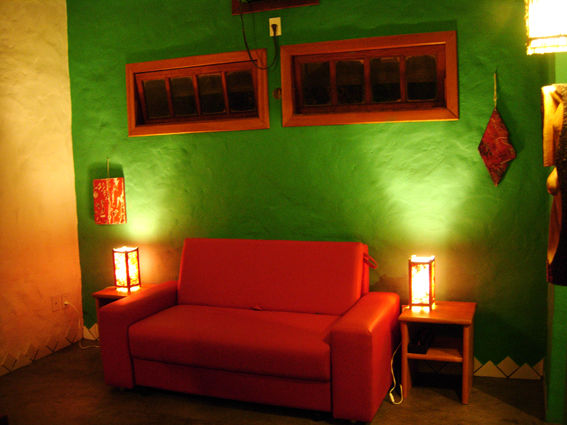 There is also a desk and a comfortable couch where you can read or watch television. 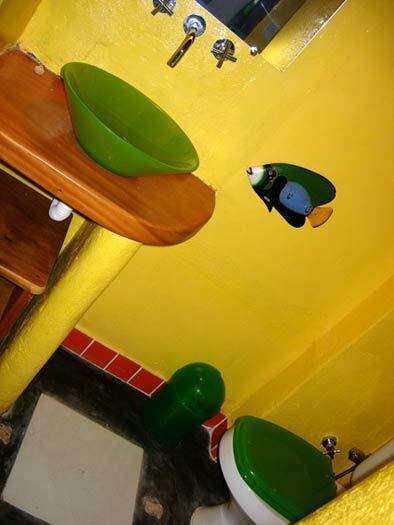 The bathroom is decorated with attention to every detail. 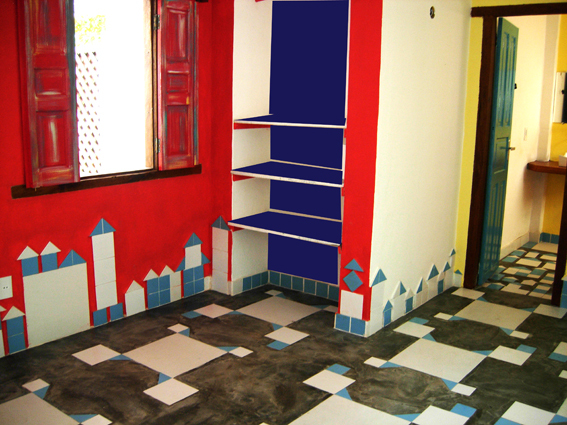 It is coloured in cobalt blue with the furnishings in wood. 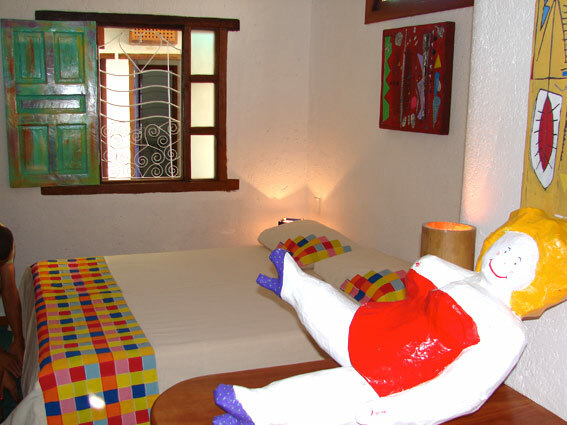 Though this suite was made with newly weds in mind, it is available to everyone. 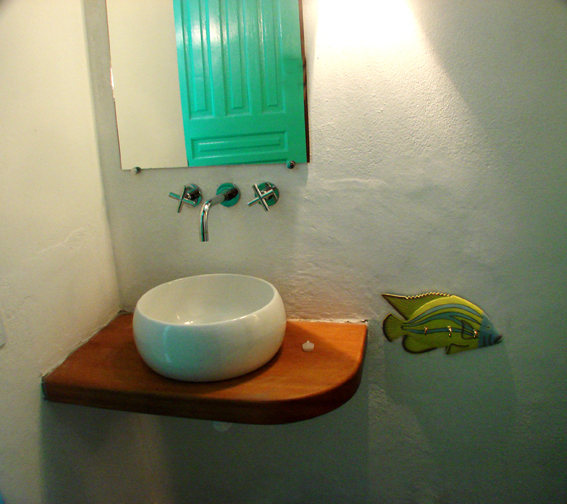 The smooth, dark cement floor of the suite and bathroom is typical of this area of the hotel and is decorated with swimming fish. This suite is the most spacious and is accentuated by two large windows. 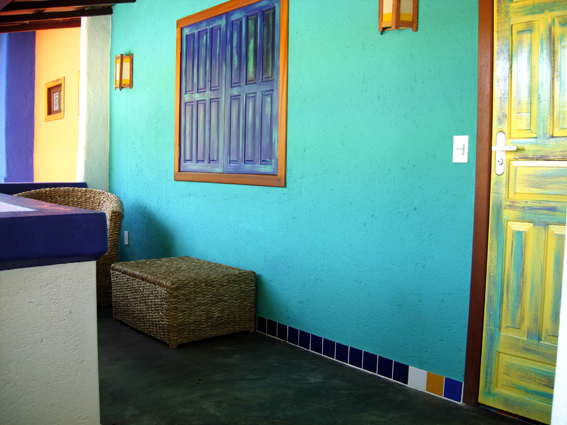 The beautiful veranda is fully furnished, with a view of the swimming pool, which adds to its charm. 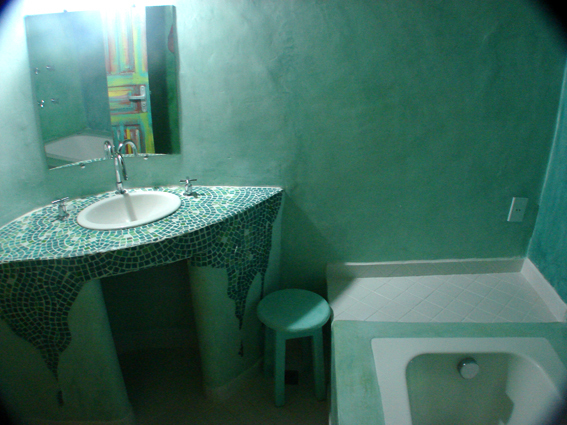 The bathroom has a large sink, fixed in wood, the cement is of a turquoise colour and builds up to create a cave where you will find the shower. 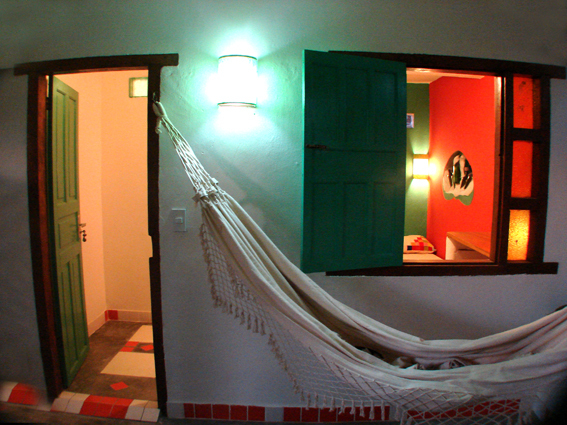 There is a little loft which can bring the number of guests in this suite to four. “La Regina e altre presenze.” (Underwater and The Queen and the Others). 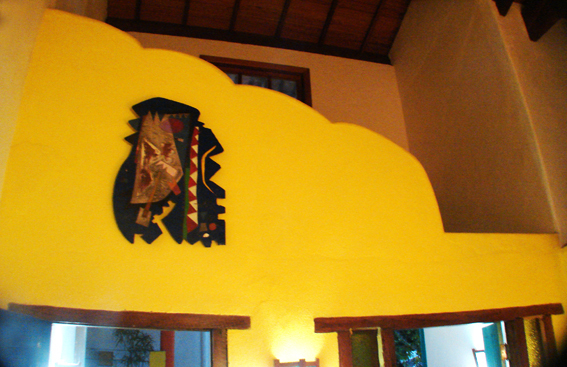 This suite gets its name from the work of art found on the wall of the veranda. 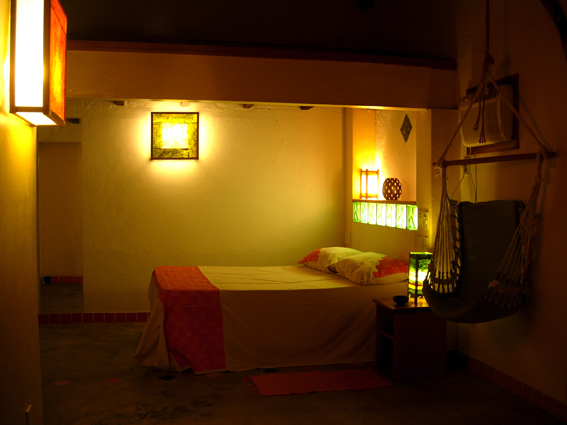 It is located close to the gym and the Spa. It is one of the more enticing suites due to its position in the garden of the White Angel, where, you can stare up at the stars at night and be surrounded by the majestic walls decorated with mosaics and works of art. 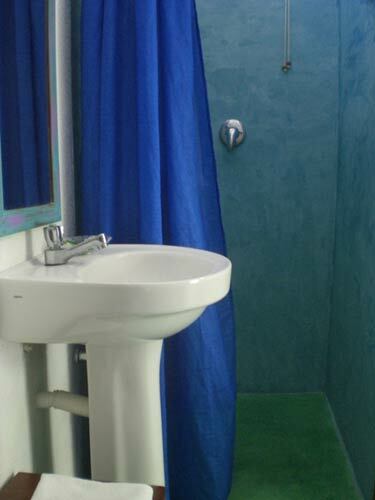 The blue bathroom walls are illuminated by a high window. 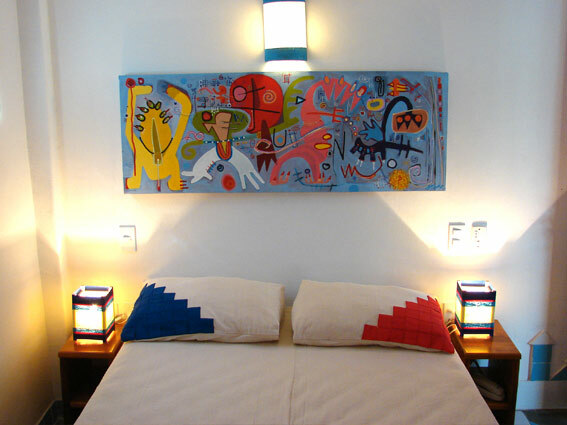 The suite itself is quite spacious, with a queen sized bed and a pull out couch which can sleep another two guests. 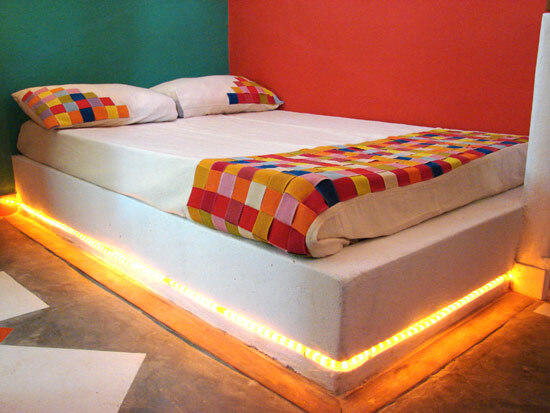 The lighting is soft, the pavement is colourful and the works of art are by the artist Bigù. 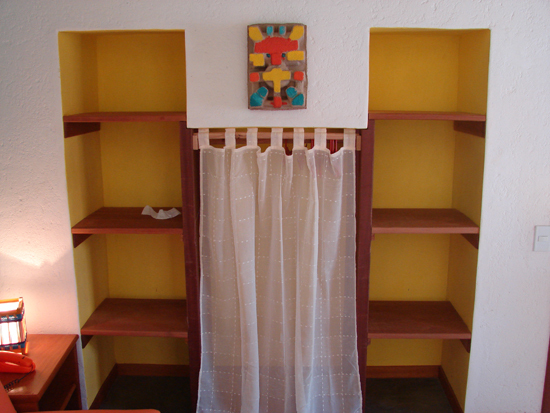 With a large closet and a corner with a desk and a bookcase, this suite has all the comforts of home. 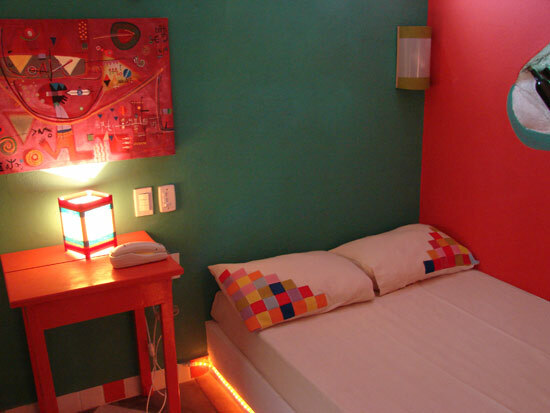 This suite is very colourful and gives off a joyful atmosphere. 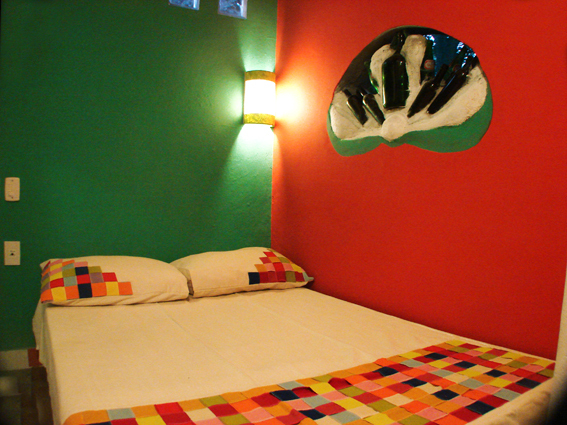 The suite is situated above the garden of the White Angel and the view from the window looks down into it. 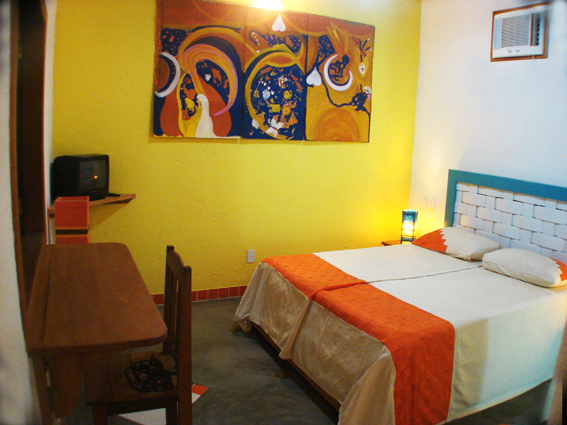 The suite is divided into two zones, the first is dominated by the queen sized bed and the other by the orange sofa with a pull out bed. 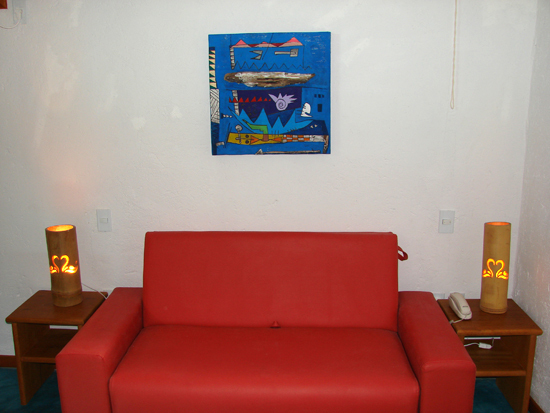 The colour of the sofa matches perfectly with the painting hanging above it, made by the Italian artist and interior designer Valentina Crobu, who is presently residing in Canada. 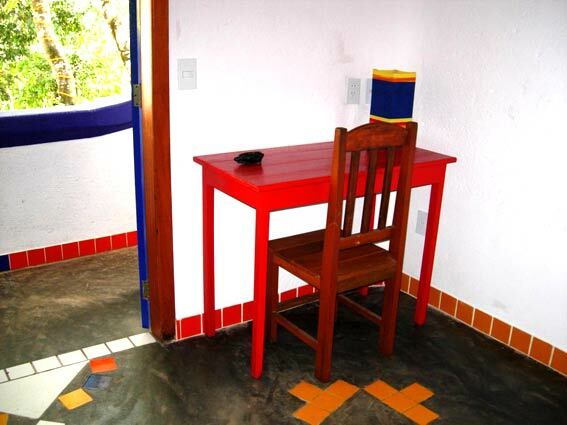 There is a desk immediately in front of the window with a view down into the garden. 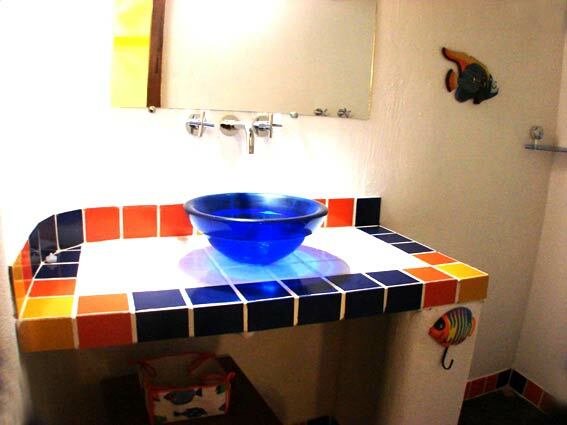 This is the only suite with a bathtub. The sky lights illuminate the space in a particular fashion, high lighting various elements made of glass, some of which are found in the waterfall, the subject of the mosaic on the wall. 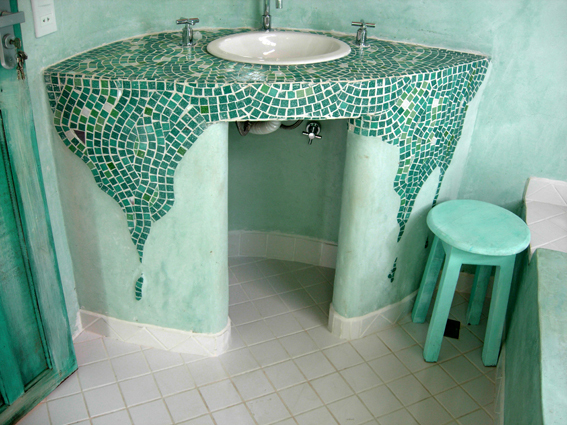 The play of blue and green tones continue the essence of water throughout. The veranda is a place which offers a profound sense of peace, where the sky seems that much closer than we are used to. 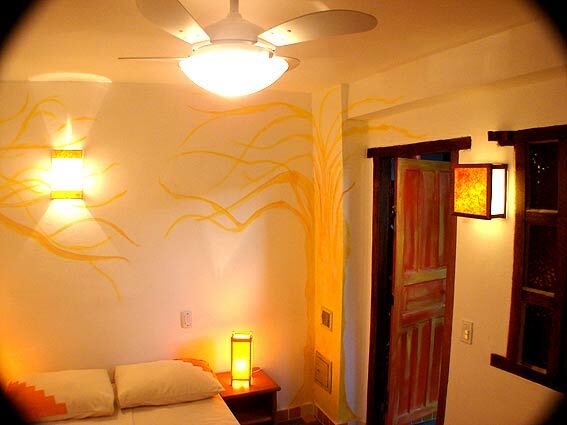 Near the white Angel’s garden, this suite is the only one we have, with two single beds.A little smaller than the others but also less expensive this suite has a very interesting decoration : frescos of planets, paintings ,wardrobe,soft lights.